familiar with his work, this is an exciting and interesting development. “The Butcher and Pint focuses on providing fresh, local, delicious products to its customers. This is very consistent with our mission and approach to food at Tusk and Trotter. The opportunity to leverage a full butcher assortment and an expanded set of equipment will allow us to experiment, invent and deliver new High South dishes to customers at both restaurants.” said Nelson. So what does that mean exactly? It means a chef who has been fighting with one arm tied behind his back, culinarily speaking, and still considered among the very best in the region is gaining a bigger forum and better equipped to continue pushing boundaries. For those of us who have ever wondered what could approach Tusk’s “Chicken and Waffles,” we may soon find out. For those familiar with the Bentonville culinary scene, this development does not come as a surprise. Chef Nelson’s focus on responsible “zero waste” food practices and his love for nose-to-tail cooking makes this a natural fit. 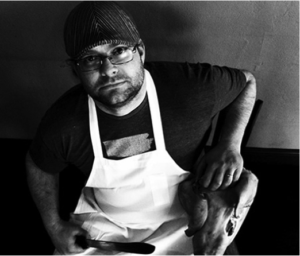 Nelson’s work with traditional butchery and charcuterie has always lived at the intersection point of avant-garde and southern cuisine. In other words: he does magical things with meat. “We don’t believe that outstanding food and a casual, entertaining experience are mutually exclusive. Why watch your favorite game while eating run of the mill bar food when something so much better is possible.” added Oaks.